This is part 4 of a multi-part tutorial on setting up vocoder plugins in Cubase. See part 1 if you missed the introduction. 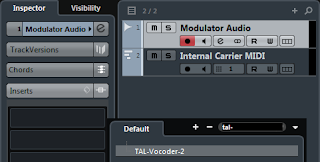 TAL-Vocoder is a free vintage vocoder emulation produced by one of my favorite indie plugin publishers, Togu Audio Line. 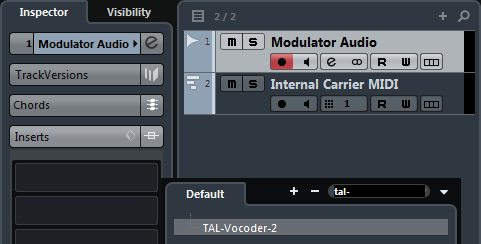 While I'm not 100% certain, I think TAL-Vocoder might be the only free vocoder plugin that is available in both 32-bit and 64-bit flavors. This plugin only offers VST 2 format, not VST 3, meaning that configuring it for external carrier use is very different from what you do with Waldorf Lector or XILS V+. We're going to take a look at two different configurations: One using TAL-Vocoder's built-in synth engine as the carrier, and another using an external carrier. In this configuration we'll use TAL-Vocoder's built-in synthesizer as the carrier. This means we need an audio track or group channel to serve as the modulator (voice), and a MIDI track to play the carrier signal on the plugin's synth. The Vocoder Internal Carrier demo project in the tutorial projects download is already set up for this. The default preset, A Voice Robot 1, is a good one to begin with. IMPORTANT: TAL-Vocoder is quite loud at its default settings. 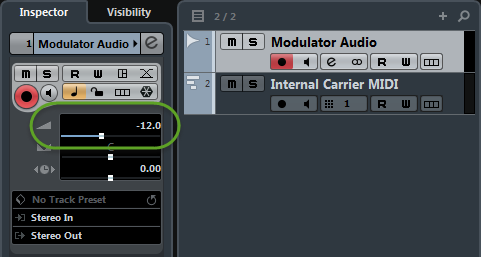 Dial back the volume of your Modulator Audio track to around -12db before continuing. If you're using a preset with the CHORUS feature toggled on, dial back a little further, like -15db or so to avoid clipping. Begin playback on a section of your project that loops your modulator and carrier tracks. You should now hear a vocoded harmony line. There isn't any visual feedback in TAL-Vocoder except for a single clipping LED. In this configuration, we'll pass audio signals for both modulator and carrier. The Vocoder External Carrier demo project includes an audio clip to use for the carrier, but the carrier could be a VST instrument as well if you have programmed MIDI that matches your audio material. 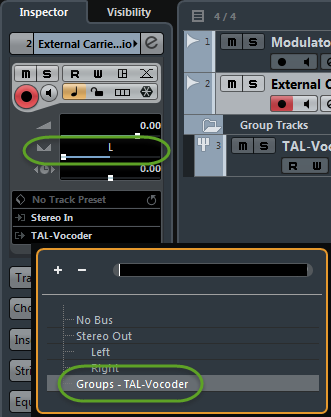 Instead of using a sidechain input for carrier audio like we're able to do with Waldorf Lector and XILS V+, TAL-Vocoder has to sit on a single stereo track or group that uses the left and right channels to carry the modulator and carrier audio separately. 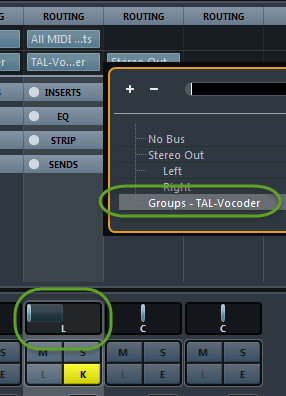 In the Vocoder External Carrier demo project (or your own Cubase project), select Project > Add Track > Group Channel and create a Stereo group named TAL-Vocoder. Add TAL-Vocoder as an insert on the newly-created group channel. I like the preset B Voice Robot Harmonic for this configuration. Click the Input Mode On button so that the green LED is lit. Pan your Modulator Audio channel all the way to the right and route the track's audio output to the TAL-Vocoder group. 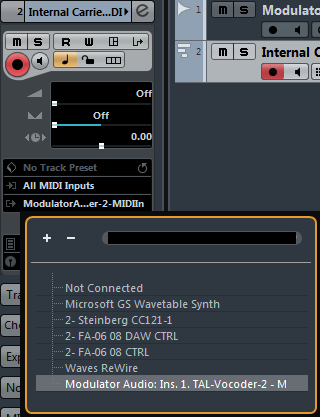 If you're using an audio track or group channel as your carrier signal, select that track in Cubase. 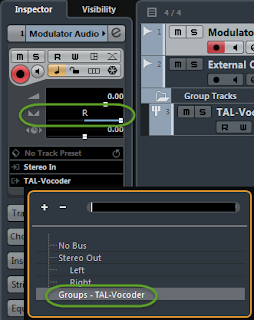 In the Carrier track's inspector, pan it all the way to the left and route its output to the TAL-Vocoder group. Otherwise, if you are using a VST plugin as your carrier, open the MixConsole, and on the channel strip where your plugin resides, pan the track to the left and change the output routing to the TAL-Vocoder group channel. Some of the TAL-Vocoder presets can be pretty loud. Dial back the volume of your TAL-Vocoder group track to at least -6db before continuing. Begin playback on a section of your project that loops your modulator and carrier tracks. If you hear distortion, you might have to check the levels of your group channel, the modulator, or the carrier. If you don't hear anything, make sure the green Input Mode On button is pressed (I've noticed it sometimes toggles off when switching presets). If you were successful in following the above use cases, you should now be able to jump in and explore TAL-Vocoder's various features.